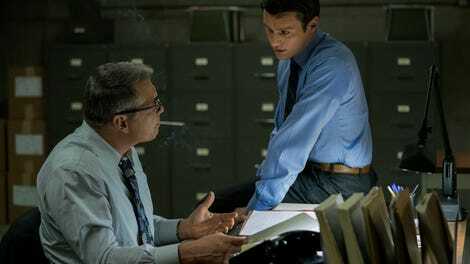 For Mindhunter to succeed, its investigations have to be successful too. That doesn’t mean Holden, Bill, and Wendy need to solve every case or understand every unique pathology they encounter. It simply means that the temperament and technique that help them produce their best work — the blend of curiosity, cooperation, openness, and uncertainty I spelled out last time, during an episode where those traits were largely absent — help the show produce its best work as well. Given what came before, “Episode 8” makes the biggest leap in that direction since the series began, in what for my money is its most riveting and revealing interview with a serial killer to date. Returning to Oregon to interview fetishistic murderer and necrophiliac Jerry Brudos — solo, this time, since Bill seems to have realized the personal cost of doing business with this particular murderer — Holden faces down a now-familiar tidal wave of horseshit. Jerry didn’t kill anyone, not even the two women he admits having contact with prior to their murders. (“Huge coincidence!” is his version of Seinfeld’s “Million-to-one shot, Doc!”) It’s all a conspiracy by the cops, who framed him once the real killer saw the heat coming down and split the scene, leaving them in the lurch unless they pinned the crimes on somebody, anybody. But in a flash of insight, Bill turns Brudos’s mendacity to his own advantage with a brilliant bit of conversational judo. If Jerry’s “theory” about what the killer did when he realized the cops were looking for him is correct, what other theories does he have about him — what he did, why he did it, how he felt, what kind of fantasies led up to him crossing that fatal line? Under the protection of a sort of killer’s kayfabe, Brudos proceeds to pretty much spill his guts about everything, attributing it all to the “real” killer. It’s like an early draft of O.J. Simpson’s If I Did It, it’s darkly thrilling to watch, and it never would have happened if Holden hadn’t found a way to get Brudos on his side so they could explore his psychology together, like he and Bill might have done themselves. But one of the few things Brudos openly cops to — the sadistic, power-hungry nature of his first childhood fantasy about a woman, and what this says about past thinking and behavior predicting future action — sticks in Holden’s craw due to another case he finds himself working unexpectedly. Invited to Career Day at a local elementary school, he meets Roger Wade, its demanding but dedicated principal. Wade (Marc Kudisch, who by the way was amazing as the manically macho performance coach Dr. Gus on Billions Season 2) objects to many of the terms Holden would like to use during his talk about the Behavioral Science Unit, on the grounds of both comprehensibility and, well, nightmarishness, but the objections come across as an educator really trying to do right by his vulnerable students, not a prude or an ignoramus stopping Ford from Doing His Job. This picture of the principal changes when Holden and, later, new BSU member Greg Smith start speaking with teachers and parents. As part of his disciplinary policy, Roger tickles the feet of his students, then pays them a nickel aftewards. Nowadays this’d get you tossed out of a tony suburban school district so fast that the sonic boom would rattle the schoolhouse windows, but it’s a divisive issue in the community among those who know about it. Some teachers find it troubling and have brought it to the school board, even the police. Others applaud the way it turns “punishment into play,” as one teacher puts it, and see it as part of the overall turnaround the school has experienced under Roger’s watch. The children seem to either like it (mostly the money) or endure it like any other punishment, and none that we hear about are traumatized; even parents who’ve thought about suing to put a stop to it are at a loss as to whether that’s even an appropriate measure. People in Holden’s personal life are split on the matter, too. He and Debbie both find the behavior disturbing. Bill thinks he’s being ridiculous. Greg is on the fence. Wendy (and Bill, and their boss Shepard when he finds out about it) think it’s a tremendous waste of time and resources, one that falls out of the Bureau’s mandate to boot. When Holden and Greg “advise” Roger to stop, he blows up, yelling that Holden’s experience with sociopaths has him jumping at shadows. But sometimes his suspicions are justified. You don’t need to be either a member of the Behavioral Science Unit or a sociology grad student to read the body language Holden sees between Debbie and her semester-project partner Patrick when the lights go up during a blackout experiment they’ve concocted as inappropriately intimate. Nor does it take a crack scholar or investigator to apply this new data to the existing evidence: Debbie mentioned Patrick a grand total of one time before, when Holden happened to see him drive her home, and she never brought up their close working relationship at all until the night before the project, at which point she acted angry that Holden suspected there might be more to it. Holden, meanwhile, has taken Debbie to his partner’s house for a dinner date. But if nothing else, getting caught red-handed means her and Patrick’s experiment is a success: It really does uncover how people would truly behave barring social strictures against it. For the second episode in a row, Holden’s playing a pee-wee league version of the same game Brudos has gone pro in. Last time out, he deflected responsibility for his inability to sexually perform following immersion in Brudos’s atrocities from himself to Debbie. This time around, he defies not just the orders of his boss, but the best practices laid down by his partners Bill and Wendy, and gets Roger fired so he can exert the control he no longer has over his own life. I wouldn’t call this technique subtle, per se (or even advisable in these specific circumstances, since it depends on the show’s most poorly written character, Debbie, to work). But normally, explaining every aberrant thought word and deed is the police procedural’s stock in trade. 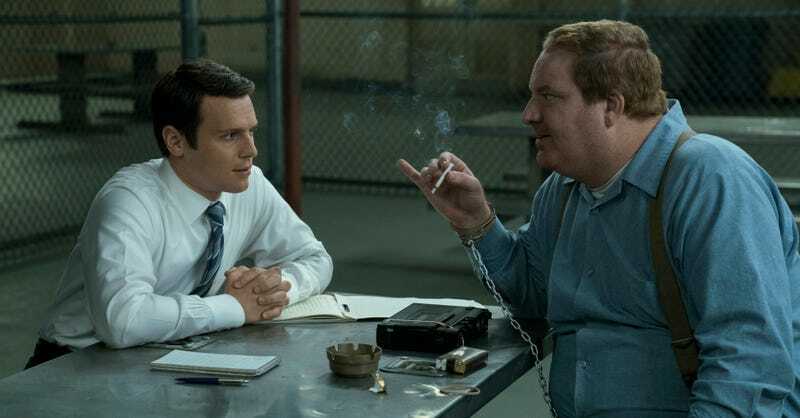 When Holden displays milder versions of the behavior dynamics he and his colleagues are uncovering in serial killers, Mindhunter at least allows you to piece it together yourself. Before they hire Agent Smith (Mrrrr. Andersonnn — sorry, had to be done) on a trial basis, the BSU’s best candidate is a guy named Jim, whom Wendy suggests they reject because he’s black whereas so many of their interviewees are a) white and b) extremely racist about it. Thus do serial killers doing life in prison exercise a hiring veto over qualified candidates of color, because otherwise the project might not work. Systemic white supremacy, folks! Gotta love it! Smith, meanwhile, is the whitest white guy ever to white. Half Catholic and half Quaker (“the family joke was we’d never run out of guilt or oats”), he’s an Ivy League grad who says cartoonishly square things like “beat the flim-flam out of him” and allows Wendy to go on an equally two-dimensional tear about, ironically, the dangers of theologically derived black-and-white thinking. He also narcs to Shepard about the principal thing. As a trial by fire, Ford has Smith listen to tapes recorded by Lawrence Bittaker and Roy Norris, the Tool Box Killers. If you can imagine why they’re called that, you can also imagine what’s on those tapes, and you can understand why you should not listen to them if you’d like to function for the next…let’s say month. Haha, such fun to watch a show in which a higher-up at the FBI berates one of his underlings for acting like the Thought Police, something the Bureau never did before and does not do now as a matter of policy. Haha. Necessary caveat: It’s possible nothing’s going on between Debbie and Patrick, because that’s the kind of thing shows do, but only familiarity with narrative conventions points in that direction. Otherwise you gotta believe your lyin’ eyes. When we first see Patrick he’s blasting a song by Tubeway Army, Gary Numan’s ersatz punk band before he found solo stardom, in his convertible. I’d leave Holden for him, too.